This with its patented “fin technology” mixes better than any other shaker…and faster, too! It is easy to clean, extremely lightweight and available in a variety of colors. With its leak-proof screw top lid, drinking spout with rubber stopper and the patented “fin technology”, there is no better shaker available! 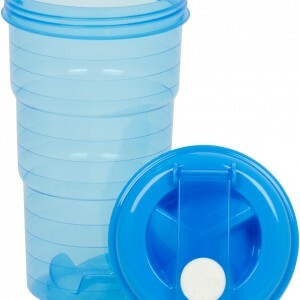 The Turbo Shaker’s patented fins are located on the bottom of the shaker and on its lid. These molded “fins” allow you to mix contents thoroughly and evenly, producing a consistency similar to an electric blender! Utilizing a space age polymer coating on the inside of the shaker, even clean up is easier than any other shaker. Simply rinse and put in your dishwasher or hand wash. The Turbo Shaker has no loose parts, no compartments, no balls, no screens, no extra gadgets, nothing that you could lose or misplace…It is Simple by Design! The Turbo Shaker weighs only 3oz, so you can throw it in your gym bag, put it in an overnight bag, bring it to work, or even to a party. The Turbo Shaker fits nicely in your cup holder and has a capacity of 28oz, making it the perfect travel companion.